The history of Captain Bill's dates back to the late 1920's when there was a simple 24' by 24' wooden structure standing at the foot of Ocean Avenue and run by the Boatmen's Association. Fishing party boats were run out of the building. One of the original boatmen, Captain Bill Eccleston would travel to neighboring towns selling fish and clams, blowing a bugle horn to announce his presence. Captain Bill was a legend in the area and quite a salty character. He eventually bought the wooden structure, started a small clam bar and named it after himself. Captain Bill sold the clam bar in the early 1950's to Sophie and Carl Abendroth who eventually renovated the building and built what is now the main restaurant. In the late 1950's, Carl and Sophie purchased the building next door as a catering hall, calling it the Anchorage. In 1982 Carl Anton purchased the marina, restaurant and catering hall, however the property was put into receivership in the late 1980's. After several attempts by different groups to turn Captain Bill's into a successful business, its doors were shut for several years until a local real estate investor, Lou Modica, purchased the property. In 1998, current owners, Peter McCarthy and Michael Korb, approached Modica about reopening the historic landmark. After a multimillion dollar renovation, Captain Bill's reopened its doors in June of 1998. One year later, the Anchorage was renovated and renamed The Bayview House, accommodating larger parties and waterfront weddings. After 13 successful years, Peter and Michael continue to manage and direct the day to day operations at this historic waterfront landmark, employing 100+ local staff. We were looking for a location for a small party, and this was the fourth venue I think we checked out, or maybe the fifth. Either way, we weren't too keen on any of the ones we had looked at before this, but we immediately fell in love with this one. The staff are awesome and they were so eager to help us with our party! They did such a great job with everything that we didn't have to worry about anything on the day itself. We just had fun along with everyone else! Outstanding! If you are looking for the perfect LI dining experience by the seaside, this is the place you are actually trying to find. It's a really lovely restaurant with a great panorama out the windows--and seafood that is everything you imagine when you think of LI seafood. This really is a top notch restaurant. The seafood is wonderful, and enhanced by the view--which is right next to the docks. When you try to imagine an idealized version of a lunch by the seaside, this is the place that you're picturing. Sunday brunch! The location is great, the restaurant is beautiful, and the brunch is just about one of the best things I’ve ever had. Seriously, why pay $15 for eggs benedict at some other restaurant when you can pay $30 here and not only get that, but also anything else you could possibly want? Sausage, bacon, waffles, shrimp, salmon … it’s a seafood/breakfast-lover’s dream. Captain Bill's Restaurant is a traditional fishing tavern with great history and some intriguing stories to be told. The food there is splendid, mostly based on seafood as you could easily guess. I love having a hot soup with fish and shrimps that is served in a big bowl with lemon on the side and some red hot pepper for the most daring. The portions were really generous, the waiter was so kind and thoughtful that really made us lovehim in a second. There was nothing that I did not like in that restaurant, the prices were normal for a seafood restaurant of Long Island and the quality is high. I totally recommend the Captain Bill's Restaurant for a top quality food of great nutritional value and taste. 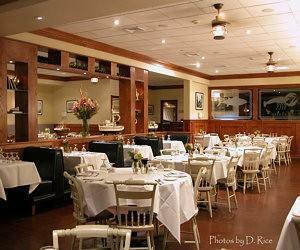 Captain Bill is a marvelous restaurant in Long Island with a lovely fine dining ambience. The choice of gastronomy is huge and delectable and you are sure to enjoy the meal to the fullest. It is located in the middle of the borough and I’ve always made it a point to catch up with friends and family here, on weekends and other days off. The first thing you notice after coming here is the informal ambience that makes want to stay put forever. The seating is plush and comfortable, the waiters and staff are wonderful and friendly and the food is absolutely ravishing. If you’re lucky, you might get complimentary drinks on certain days. I love it each time I’m here and I certainly plan to keep visiting! Highly recommended for evenings with friends and family. So you usually go to a restaurant for the view, well with Captain Bill's Restaurant, you not only get a breathtaking view of the waterfront, but you get excellent service and food that you won't forget. My wife and I try to make a night out at least once a month and this is a place we really like to go. Captain Bill's Restaurant is waterfront dining at it's best. We especially like to go for Sunday brunch, as there is such a wonderful selection of food. Many people use their catering services, and if I ever have an occasion to I will also. I have only had the chance to dine at Captain Bill's once since moving to the Island, but I am going to get back very quickly. Never before have I enjoyed a restaurant so much. The waterfront location is one of many delightful things about this restaurant. Once you step inside you are met with so many more delights as well. The inviting setting features white linen covered tables in an intimate setting, which I loved. I expected a menu of just a few items but was pleasantly surprised when handed the menu. I finally decided to try the Boiled Seafood Platter which offered me a sampling of several different items. The food tasted like perfection. Never have I tasted seafood so flavorful, so enticing before in my life! The plate arrived at my table ready to impress, with my cheerful server excited to see me try their food. The waiter at my table offered suggestions and seemed to love his job and his restaurant. He was so quick and an absolute sweetheart who made my trip terrific. Prices were great for a Long Island restaurant. Plates are piled high with food. After my Platter I was stuffed. This was an amazing dining experience that everyone should have the pleasure to enjoy. I know that I did and will be seeing a lot more of Captain Bill's in the future. I have never before been to a waterfront diner that came even remotely close to the experience I had at Captain Bill’s Restaurant. The view is simply breath taking, and the location is beyond relaxing. But better than good scenery, Captain Bill’s has the best seafood hands down that I have ever eaten. And what’s not to like about a restaurant that offers an all you can eat brunch buffet, too? If you want to have a beautiful view and a great seafood meal, I highly suggest Captain Bill’s Restaurant. It is definitely one of my favorites of all time. Whoa... where to begin? I grew up fishing the local piers right at Captain Bills docks... The waterfront dining experience is second to none. Great work guys and I'm even considering booking my daughters wedding with you guys as I hear your location also makes a very good place to host a wedding. Looking forward to this. Do you have any experience using Captain Bill's Restaurant? If so, please rate your experience and let others hear about it using the form below.